We hope you’re getting excited for the 2018 March for Science! The 2018 March for Science on April 14 is a worldwide movement that draws attention to the importance of science in exploring and explaining our world, enhancing our daily lives, and improving policymaking. It is an opportunity to communicate the importance and value of science. This march reminds everyone that when we use science to inform our decisions, we all benefit. If you are attending the March for Science in Washington D.C., please join your fellow science supporters at AAAS headquarters for a continental breakfast and rally before marching in FORCE to the National Mall. By taking these steps together we demonstrate to the world that we believe science informs and improves our lives and that only through working together as scientists, teachers, doctors, policymakers and concerned citizens can we ensure science thrives. If you can join us, please RSVP here, and let us know the number of people in your party. Kindly let us know if there are any food allergies or other accessibility needs by April 9, 2018. For those without hand signs, AAAS will have some available for participants to use at the rally. AAAS will have a teach-in on the mall, starting at 9 am. With more than 175 marches across the globe, there are many opportunities for scientists and science advocates to engage with their local communities. AAAS and Sigma Xi have a collaborative partnership to advance, enhance and safeguard the scientific enterprise for both individual scientists and the role of science in society. For Sigma Xi members and AAAS members attending one of the satellite marches, Sigma Xi chapters are planning activities to engage our local communities, and we encourage our combined membership groups to connect with chapter organizers. Connect with Sigma Xi chapters here. This page will be updated as more events are organized by chapters. You can also connect with other AAAS members in your area on the AAAS MemberCentral Community on Trellis. Learn more about why AAAS is involved in the March for Science. Need some inspiration for your sign? We’ve got you covered. Printing Instructions: Each sign is ready to take to your local printer. They are double-sided and include crop marks for easy trimming. We suggest you request a white, heavy card stock paper and be sure to ask your printer to trim using the crop marks. The finished size should be 18x24 inches. "Why I Marched for Science"
AAAS is committed to providing a safe, productive, and positive March for Science. We ask our staff, our members, our guests, and the public to help us foster an environment that encourages open dialogue and the exchange of ideas, promotes equal opportunities and treatment for all participants, and is free of harassment and discrimination. All participants are expected to treat others with respect and consideration, follow venue rules whether in private or public spaces, and alert staff or security of any dangerous situations or anyone in distress. Events and participants may be audiotaped, videotaped, or photographed by AAAS. 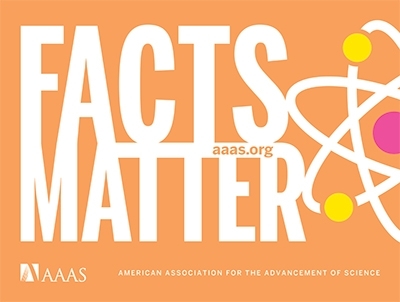 Your image may be used in promotional or other AAAS materials.